Lyme disease is said to have already existed in 1975 in Lyme, Connecticut, USA but it was not until 1982 when it was named as such. Afflicted children back then were thought to suffer from rheumatoid arthritis until the identification of the bacteria that caused the disease. But what is this disease? The name is apt to have been derived from the place where the researchers first identified the bacterium, Borrelia burgdorferi also known as spirochete. Found in the stomachs of ticks, the bacteria is spread to humans during the time a tick feeds on blood and its stomach liquid goes up via the saliva and injected into the skin of its victim. On its early stage, Lyme disease is marked by an expanding circular redness where the tick bit but as the illness progresses, it can affect the rest of the skin and cause some abnormalities, the joints, the heart and later on the nervous system. There are places in the United States where the disease is common because of the great number of infected ticks. A rash called Erythema Chronicum Migrans (EM) is almost always the first sign of the disease in at least 50% of patients. It resembles a Bull’s Eye. The rash would start at the bite area as one small red mark that slowly grows outward becoming lighter in the center. 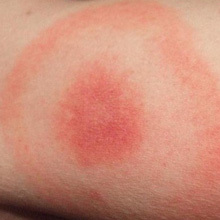 As Lyme disease develops, other areas of the body will also develop a rash that initially looks similar to a spider bite. As the disease continues to affect the body, the symptoms would vary in degrees. Skin inflammation is often the first sign but in its later and more serious stage, it could damage the motor and sensory nerves when brain inflammation occurs. In some patients, heart inflammation has also been reported causing erratic heart rhythms and failure. When properly diagnosed and identified at the early stage, oral medication such as amoxicillin, doxycycline or cefuroxime exetil takes care of the illness. The strength, dosage and type of antibiotic may have to be higher though in advanced stages. As a precaution, pregnant or lactating mothers and children below the age of 8 should only take medications under the strict guidance of a doctor. Pain relievers for the relief of joint, neck or back aches caused by the infection. Fluid removal called arthrocentesis in case of a severely swollen joint. Intravenous drugs such as penicillin G or ceftriaxone in more serious and advanced Lyme disease cases. A single dose of doxycyline may help prevent an infection after a bite incident made by Ixodes, a classis deer tick, where the tick has been attached for nearly 36 hours and the disease is common in the area. Just like any disease, the most effective way to stay free of it is to avoid exposure. As ticks are known to carry this type of disease, staying away from tick-infested areas could be your best bet. Aside from that, you may use tick repellant sprays or use anti-tick treated clothing and boots when venturing outdoors. In addition, it may be good to know that Lyme disease, according to various studies, may depend on how long a tick has been feeding before it is transmitted. Also, the infection does not spread from person to person.